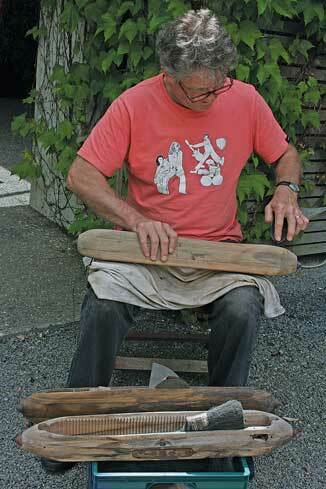 The Kapiti Coast District is home to an amazingly diverse collection of artists and artwork. The recent 2014 Arts Trail weekend provided a brilliant showcase for their craft, the region was alive with colour and creativity, and strong winds proved no deterrent to the crowds that arrived both Saturday and Sunday. Now in its fourteenth year, the Trail included two new hubs this year – Nga Purapura in Otaki and the Southward Theatre Auditorium in Otaihanga. Potter and ceramist, Jennifer Turnbull, of Jailhouse Pottery, said both days were busy, and people were buying as well as looking. A surreal experience lay in store for those visiting Shelshok in Otaki. It was the first time as part of the Arts Trail for Lynne O’Connor, who creates imaginary worlds and creatures, and sometimes objects more ordinary, but no less clever, from blown eggs. “I use hen eggs, usually white, because they’re easier to paint. I make a hole in each end and blow the contents out. I give them a good wash then let them dry in the sun,” she said. 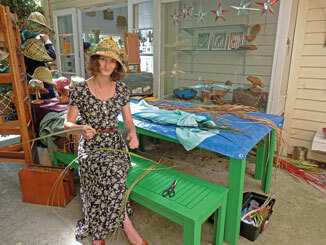 At Blue Skies Gallery, Hyde Park, Te Horo, I found Jasmin Van Lith weaving a variety of headwear from flax. Jasmin is an accomplished artist skilled in a wide range of materials and techniques, but specialises in weaving and slip cast jewellery. Her hats were amazing, in several styles including caps, and visitors could also purchase one of her recycled copper hat pins. Also based at Hyde Park is Artscape Gallery. No newcomer to the Trail, the gallery constantly features high quality craftwork and this year was no exception. Featured was an array of clay-work, including exquisite clay flowers (New Zealand Daphne), and a range of fabric art, painting and photography, jewellery and wood craft. The annual Arts Trail has grown to become one of the most significant free public events on the Kapiti coast with 68 studio artists, 20 art and artisan hubs, and 15 cafes and galleries taking part this year. With so many places to visit and things to see, where was one to start viewing, the dilemma of the Kapiti Arts Trail weekend. First it was up Otaki Gorge Road and carefully over the swing bridge and on to the Scape Sculpture Park. With 66 sculptures and art works, plus Bee Doughty-Pratt’s own gallery and art display, a whole day could easily be spent just to view everything – there was even a café to re-energise at! 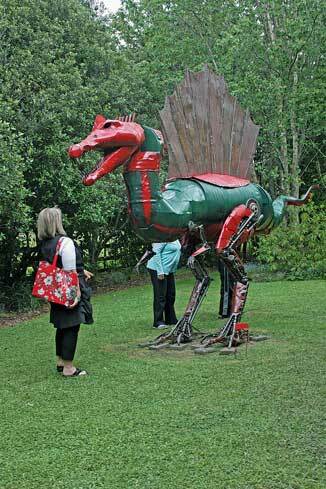 Some of the permanent, huge sculptures have been pictured in promotional works, but to walk under and around Spinosaurus, or get up close to Plexus Snowflake – the ancient horse, was another gave them another dimension. An artist in residence, Bee was busy out in her gallery painting, demonstrating some of her techniques to interested visitors. 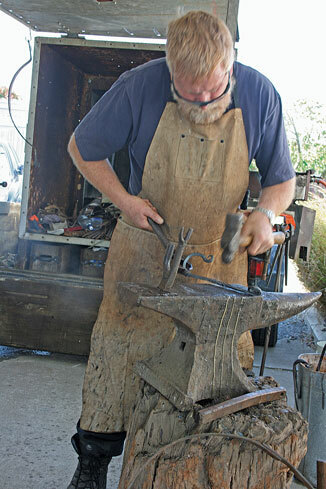 Sculptor, Bruce Winter from Pinehaven, was busily sanding down some vintage bobbin shuttles from an old carpet making loom – the insides still had each cleat the wool passed through and one even had a spool of thread attached, fascinating. Bruce was planning to make something else with them. Next stop the Otaki Highway Baptist Church and the Art and Artisan Hub. The church held a gallery of paintings from a number of artists, including some interesting pieces from the people at the Artarium (Idea Services clients), old time crafts – blacksmithing and bodging, quilting and garden seats from recycled timber were available, also children’s books by local author and illustrator, Josephine Van Den Berg. It was impossible to do justice to many of the 100 plus venues, between Otaki and Paekakariki, but sufficient to know the cream of the Kapiti Coast artists was on display, for another very successful Kapiti Arts Trail weekend.